Searching and applying to colleges is a long and complex process with many dates to keep track of. Ideally, students should begin thinking about colleges in their freshman year, with the bulk of the research being done between their sophomore and junior year. Senior year is often taken up with the work of applying to colleges, scholarships and financial aid. Keep your child’s applications on track with this timeline. Starting early will make the college search process considerably less stressful. When students begin high school they should also start thinking about their options for continuing their education. Have them talk to their guidance counselor about what classes they should be taking and what subjects interest them most. Students can begin assembling a list of possible careers, majors and colleges that interest them. This is prone to change as they grow up and get a stronger sense of what it is they want to do, but it helps to think about it early! To begin to get them thinking about the process, have your child take Majors Matcher to learn more about their personality, strengths, and interests and the careers and majors that would fit them best. The right college for your student is one that fits them academically, socially and financially. For more on finding the right fit, see this article. By the time junior rolls around your student should have done the bulk of their college research and formed an initial list of colleges to explore further. If your child is planning on taking the SAT they can plan on taking the PSAT in their junior year to prepare. This is typically scheduled in October. If your student plans on taking the ACT, look into the PreACT to help them prepare. Begin to schedule trips to visit colleges. While this may be more convenient in the summer, it’s beneficial to visit a school while school is in session so you can get a better feel of what it’s like. This is the best time to take the ACT or SAT for the first time. The SAT is offered in January, March, May and June. The ACT is typically scheduled in February, April and June. Your students should be planning to take the test for the second time in fall of their senior year. By the time summer rolls around your student should start whittling down their initial list of college to a final list that contains the schools that are truly best for them. They should also begin searching for scholarships that may be applicable to them. Senior year is a very busy time for students as they will be studying for tests, applying to colleges and applying to scholarships all at the same time. Have your student meet with their guidance counselor to make sure they are on track, and create a calendar of events to keep track of deadlines. Your student should assemble their final list of colleges to apply to. The amount of colleges in this list will vary depending on how much you can afford to spend on application fees, and how narrow of an area of interest your student has. The rule of thumb most advisors suggest is to have 1-2 safety schools, 3-4 good fit schools, and 1-2 reach schools on your list. Students should request any letters of recommendation they need and begin working on application essays for colleges and scholarships. Make sure your child fits in time to study for the SAT or ACT. Starting in 2016 October 1st is the first data you can submit the FAFSA for students who wish to attend college the next year. This earlier date gives more time to students and parents as well as colleges in determining financial aid packages. Use your tax return from the spring in order to fill out the FAFSA. It is still to your advantage to complete it as early as you can to ensure access to first-come first-serve financial aid. The SAT is typically scheduled in October, November, and December. The ACT is scheduled in September, October and December. Your student should be prepared to send their scores directly to their colleges of interest. Applications to scholarships are due around this time. Early decision or early action applications are usually due in November. Students will receive notice that they were accepted in December. This gives you a few weeks to apply to other colleges by their deadlines. For more on applying early decision or early action read this article. Most college applications are due in December or January. Breathe! You’ve made it through fall semester! April is when college acceptance letters and financial aid offers come in. You and your child should review and compare financial aid offers in order to determine which school is offering you the best deal. If you’ve done your research, there shouldn’t be too many surprises in the financial aid packages. For guidance comparing costs and negotiating a better price learn more about College Cost Cutter. 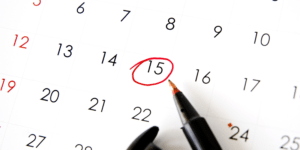 Most schools have enrollment deadlines of May 1st. Your child should contact your chosen college and make any necessary deposits. Make sure your child doesn’t give into the senior slump. Grades still matter even after they have been accepted into college! Enjoy your summer with your high school graduate! Congratulations! Use College Factual matching tools and get personalized advice and reminders sent to your inbox.